You have business to cultivate! Every day, same time, have a Facebook live video of The Great Gift Unboxing! And the gift? Some sort of sales promotion on some category or item your customers might be needing right now. Step One: Tell your followers in every way you have at your disposal that The Great Gift Unboxing starts [day] at [time] and that they should tune in to celebrate, with you, the wonderful styles, selection, and savings you will be presenting (get it?) to them. Step Two: Wrap up a variety of boxes in festive paper. Wrap the TOP and the BOTTOM separately… you will want to gracious;ly OPEN the box, not be tearing paper on mic. Pile them all up on whatever your “stage” will be, so you’ll also be able to use signage there saying Tune in or Stop In to see what gift each day will bring to you! Step Three: Figure out your festive attire: Elf, Santa, and use it every day, even of you switch presenters. Write a simple 2-3 sentence script introducing yourself and your shop, then open the box, pull out the prop or the (fancy of course) scroll announcing the gift, and talk a sentence or two about it… then revert to a prepared closing like That’s today’s gift from MyShop located at … And don’t forget, we’ll be presenting a NEW Great Gift Unboxing holiday gift tomorrow right here on our Facebook page so tune in or stop by to see the surprises we’ll have for you! Mix it up. Dollars off, percentage off, BOGO, earn an extra punch on thier Frequent Buyer Card, get a small gift with purchase. Make sure the noise of unwrapping doesn’t drown your words out. As always, film in front of your shop name, logo, signage, anything so folks know who’s offering this great deal. 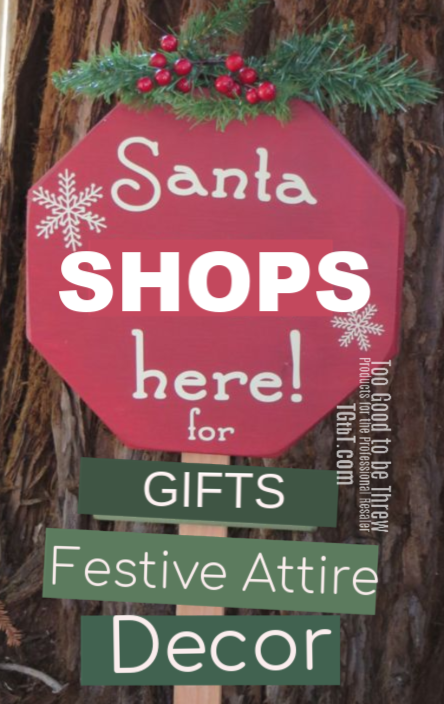 Christmas Promo for Consignment & Resale: St. Nick! On December 6 (or December 5 or December 19, it’s complicated) is St. Nicholas’ birthday. This saint known for gift-giving morphed, along with his name in Dutch Sinterklaas, into, of course, Santa Claus. St. Nicholas Day, though not particularly observed in the US, can be a great hook on which to create a resale shop promotion. So what does all this history, you may ask, have to do with selling resale merchandise? Yup, that’s it. Traditionally, children put out their shoes to be filled with either coins/candy/small gifts or coal/twigs, depending on the child’s behavior that year. St. Nick filled folks’ shoes with coins on December 6. WE save you coins all year round with our FAB shoe selection! Imagine golden coins/ tokens tossed throughout this display…. More about jolly old St. Nick on Wikipedia. More display/social media photo suggestions in The Big Book of Window Displays. What do shoppers want when they’re Christmas-gift seeking? Need more holiday selling ideas? Click the pic. They aren’t sure what they want. Or what their loved ones will want. Sometimes, they’re even clueless as to what to look for. So MANY choices for simple and effective (that means people will TALK about your windows and take selfies in front of them and bring their guests in just to see!) holiday windows that are easy and inexpensive, I have to divide the inspirational photos I have into three days! Today, let’s talk Santa Claus as holiday window decor. How about Santa’s wardrobe on a clothesline? Don’t let Santa hang you out to dry, shop resale for the holidays. Or We’re Santa’s backyard. Or Santa gets ready for his run here (The illustration is a purchasable backdrop you can see here.) This could be an actual clothesline, or cut outs on your window glass. 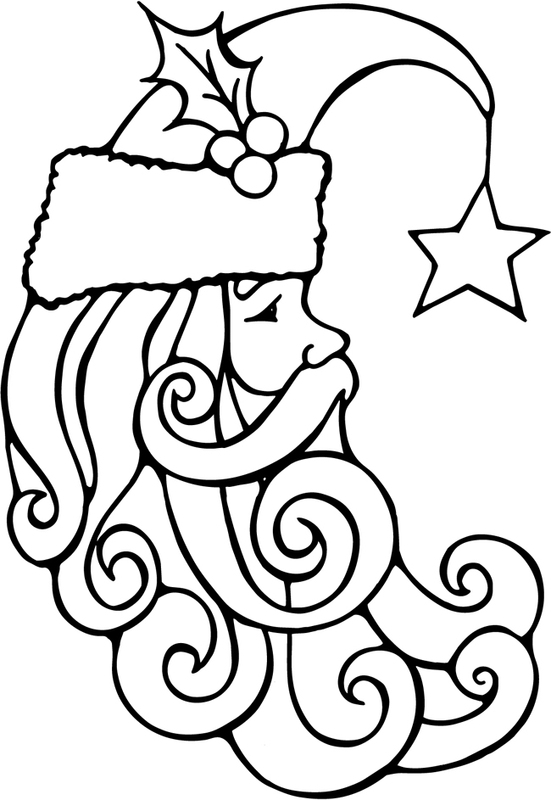 If you have a talented window painter on tap, this template from Dover Publications could be wonderful… as an outline, or filled in with touches of red and green and a nice golden star! Yesterday in Part 1 we focused on Christmas trees. And tomorrow we’ll be talking my favorite seasonal decor, so stay tuned!